InLoox PM Web App clearly defines project budget by planned and actual expenses and revenues in minimum time. InLoox PM Web App provides following budget types as plan revenues, plan expenses, actual revenues and actual expenses. A budget has a status and usually contains positions. Enter a name in the Name field. InLoox PM Web App affords such budget types as planned expense, planned revenue, actual expense and actual revenue. 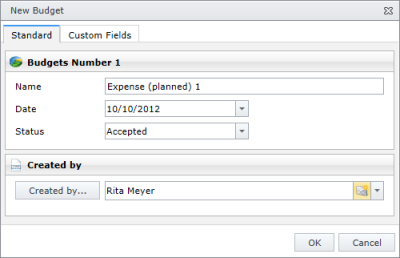 Use a unique name to make it easier for you and your customer to assign a budget from outside of InLoox PM Web App. In this area define the budget status. Choose Accepted, Rejected or Open in the Status drop-down list. In the Budget area, in the Date field, choose a date. The actual date is set automatically, when creating a new budget. In the Created by area click Created by... to add a person's name, who creates this budget document. Send an email message about the new created budget. Click email icon right to the Created by field. For more information see Select project team members, in a Send an email message section. How to define and edit a project budget | InLoox PM 7 Web App • Copyright 1999-2019 © InLoox, Inc. All rights reserved.